Jobu reacts to the newest Yankee, Masahiro Tanaka! Sorry to Vidal Nuño, who was supposed to be featured in our main post this morning (don’t worry, I’ll post that this afternoon), but huge news struck out of Japan, as the Yankees have signed the elusive Masahiro Tanaka. This, along with the signings of Carlos Beltran, Jacoby Ellsbury and Brian McCann, means the Yankees have officially won the offseason. 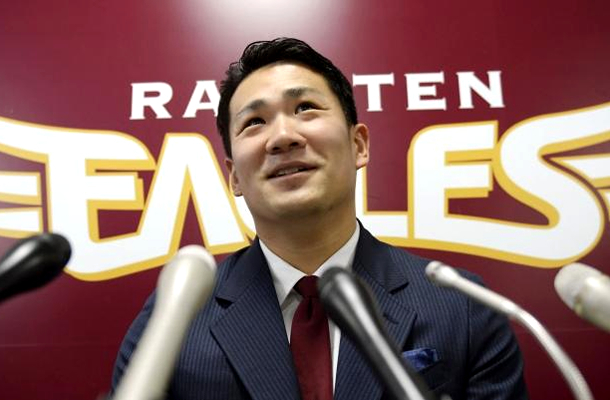 We’ve covered Tanaka all offseason long, so there’s not much need to go into detail on his qualifications; but, according to Ken Rosenthala, the Yankees have signed the 2013 Sawamura Award winner (the Japanese Cy Young Award) a seven year contract worth $155MM. Tanaka can opt out of the deal after four years, when he’ll still be just 29 years old. The Yankees came into this off season needing another top of the rotation type of arm, and they went out and got their man today. Many thought the Dodgers would land Tanaka because they are on the West coast and have more money than they know what to do with. Others thought it would be the Cubs, who have plenty of money and even more desperation (100 years will do that to you). In the end, Hal, Hank and the Cashman stepped up to the plate and made Tanaka the offer he wouldn’t refuse. What can we expect from Tanaka this year? Right now, he’s probably slotting into the number two spot in the rotation. Wherever he slots in, he’ll join CC Sabathia, Hiroki Kuroda, Ivan Nova and, for now, one of the kiddies (Michael Pineda, David Phelps, Nuño or Adam Warren) in the Yankees rotation. Once spring comes around, and we see this guy pitch, I’ll probably have more coverage. For now, I’m just gonna go enjoy Tanaka day. Brian DeVivo liked this on Facebook.